Summer, whoops, I mean SPRING is here! hahah... Just for you guys and gals who may have been too busy soaking up the sun lately, instead of paying attention to your calendars... Today is the vernal equinox for 2012, which marks the end of winter and the beginning of Springtime here in the northern hemisphere. I look forward to this date each year, and this year I couldn't be happier. "Why?" You may ask... Because somehow we seemed to have skipped right through winter this year. No long periods of frigid cold temps, no snow, no ice, no battling dangerous road conditions--its' like mother nature hit the pause button for a few months back in November, and then skipped tracks straight ahead into Springtime. Fortunately for us, the weather was not the only great thing about this past winter... The fishing was equally great. Most years once the middle or end of December rolls around, we start to see ice on our local flows here in central PA. It never happened this year. 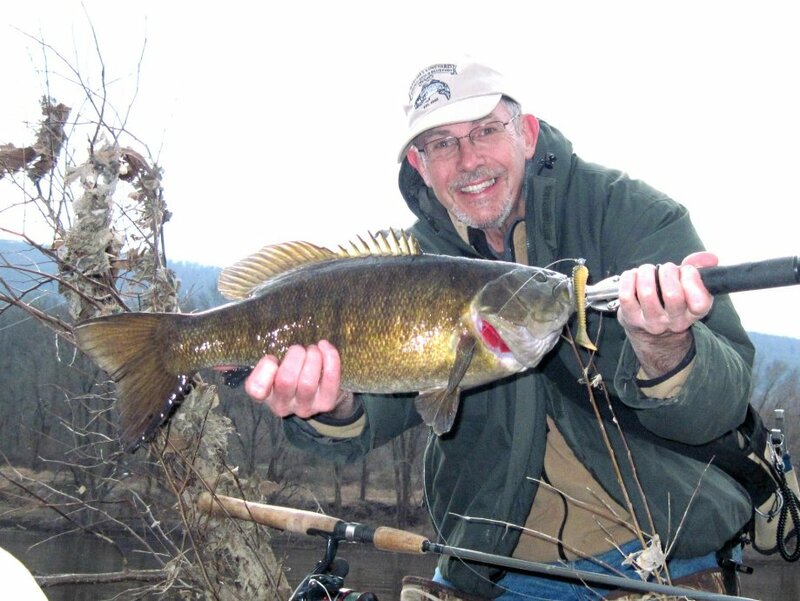 The rivers stayed wide open all winter long, and likewise we kept fishing all winter long. 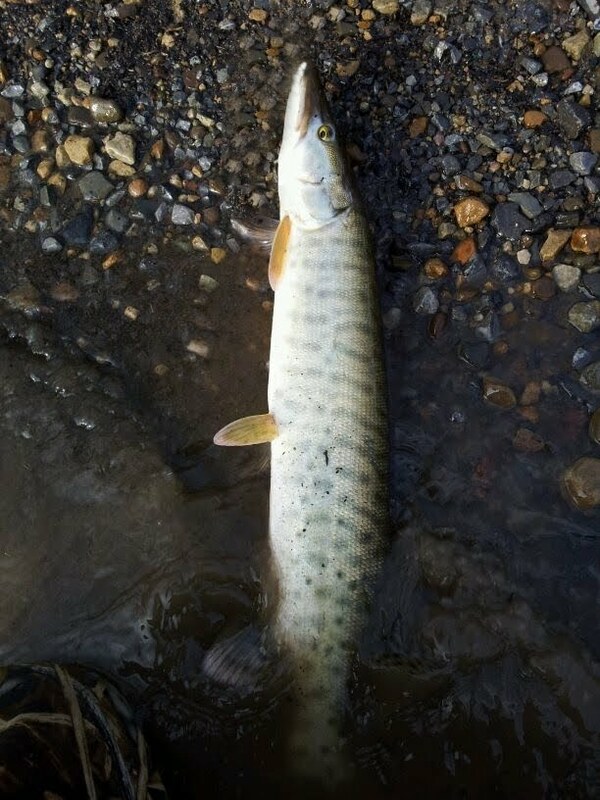 Since my last report, (with the exception of our quick trip to Erie) we have spent a fair amount of time targeting bass and muskies in the rivers here locally, and we have been fortunate enough to make some pretty cool catches... My Dad made an especially great catch about two weeks ago. He and I were lucky enough to catch a nice period of falling water on the ri ver after a strong rain had spiked the flow charts. We made a quick trip to hit a couple spots that we thought might hold some good fish... It didn't take Dad long. 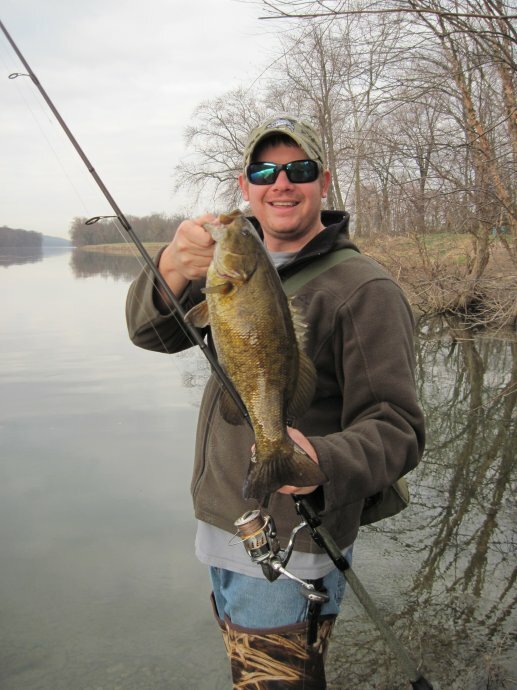 About 3 or 4 casts into our session he hooked up with a bruiser! 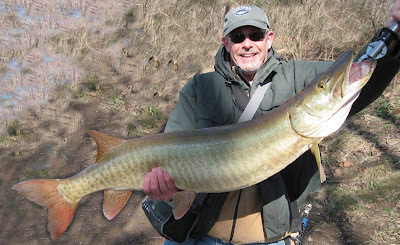 The big musky fought hard and spent a lot of time on the surface thrashing its head. 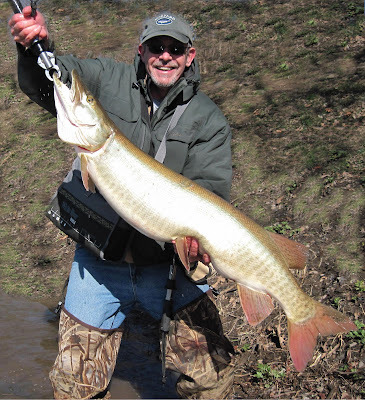 The big girl ended up measuring 42 inches and weighed 24.5 pounds--a big fat fish that was obviously full of eggs. It was a pleasure to watch her swim back to the depths... She woofed down a large-bodied, trout colored crankbait. 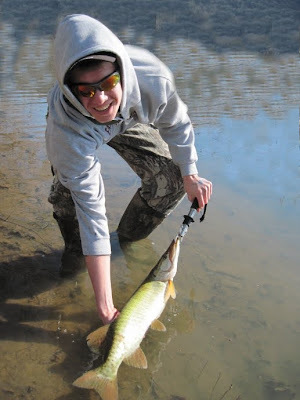 Dad wasn't the only guy in the family to have success with muskies lately either... My nephew Bailey joined my dad one afternoon for a quick musky hunt and had some success. In fact, he landed his first musky! A pretty 30 incher... WTG Bailey! 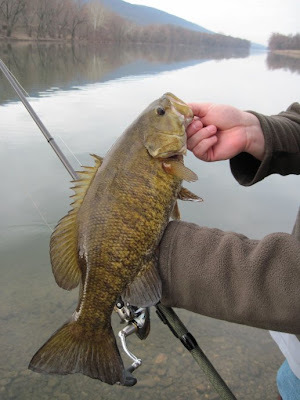 Obviously, the toothy critters hold a pretty special place in my heart, but for the most part the majority of our action the past couple of months has been with bass. 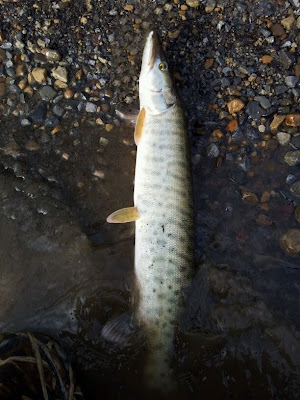 I did pick up a small muskie one morning on my daily commute home from work, but mostly it has been picking up a couple bass here and there for me. My dad has been out slaying them most afternoons and a couple mornings as well... He has landed a few in the 20 inch plus range recently. With all the warm temps that we have had lately, the bass are full-out in pre-spawn mode right now, and I wouldn't be surprised at all if some of them start spawning soon if these temperature trends continue. This is probably the best time of the year to get a shot at the largest bass in our local rivers and lakes, so if you have the time, get out there and enjoy the awesome weather that we have been having lately. It's not every year that we have summer weather in March, and the fish don't always wake up this early. Who knows, maybe you will catch a trophy. However, please keep in mind the local bass fishing regulations that will be going into affect this spring. 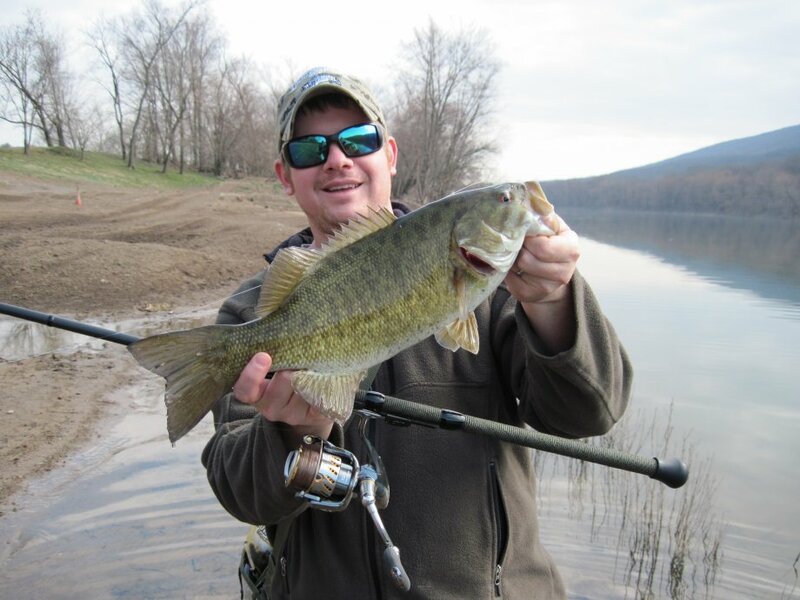 In the lower sections of the Juniata and Susquehanna rivers you will not be allowed to target bass during a designated spawning season, which runs from May 1st until June 15th. 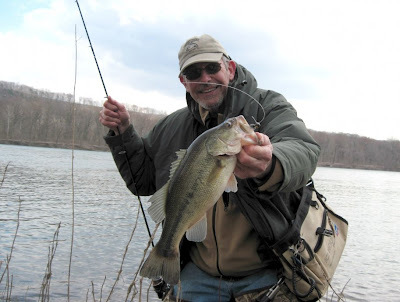 So, please be aware of the section of river you are fishing this spring and whether or not you are permitted to target the bass. In closing, I am sure most of you have noticed that I haven't been updating my blog here nearly as much as I had in the past. I just wanted to let you all know I this will probably continue. Marianne and I are moving into a new phase of our life together... One that we are very excited about! Come September, we are going to have a new addition to our family... (and no it's not going to be another puppy dog---Lucy can breathe a sigh of relief) So if you happen to notice in the coming months that I haven't been on here to update my blog, you will know why-- I will have had many more important things to do, haha! Still, I will be back with updates from time to time, who knows , maybe even more than I think. So keep checking back... I will try to keep you updated as best I can. As always, thanks for reading, and hopefully I will see you guys out there on the water.